Roatan is an island located a mere thirty miles north of Honduras mainland that has become a common stop for many Western Caribbean cruises. The island itself, while just over two miles wide, is the biggest of all the Bay islands, measuring nearly forty miles long. There is a distinct sense of serenity here, where guests enjoy a feeling of remoteness and a lack of hustle thanks to a lack of traffic lights and industry. Natural beauty emphasized by Roatan’s location along one of the largest barrier reefs in the world as well as immaculate beaches of white sand have made the area incredibly popular with tourists. There are many things to do in Roatan, however while the island is still trying to find its identity, many of the available activities in the area are excursion based. They can be booked through the cruise line or directly with the operators and focus on the immense diversity of wildlife and the natural beauty of the area. As a tourist destination, the Roatan cruise port itself serves as an actual destination, thanks to a mammoth investment by cruise ship lines. We compiled a list of the ten best things to do while ported in Roatan, a place that is quickly becoming a favorite stop for many aboard Western Caribbean cruises. 1. Mahogany Bay Isla Roatan: May as well get the port itself out of the way. The multi-million dollar tourist trap sponsored by Carnival cruises is a welcome and inviting place for cruise ship guests to unwind and relax. Serving as a welcome center of sorts for the entire island, Mahogany Bay at the Roatan cruise port boasts typical tourist trap attractions like shops selling local trinkets and jewelry, restaurants featuring local fare and occasional live music. The Roatan cruise port is also an excellent place to snag a rental car, hit an ATM and grab some souvenirs. But, aside from typical tourist things, the port is also the place to book Roatan excursions with local operators and catch a chair lift ride to paradise. 2. Mahogany Beach: Some of the best beach vacations are had in this part of the world where pristine white sand meets teal transparent warm waters. The chairlift from the Roatan cruise port takes visitors to Mahogany beach, which includes ten entire acres of private paradise. For a mere five dollars, a day long pass is granted and rides to and from the Roatan cruise port are included all day long with no limits for the nominal fee. 3. Butterfly Farm: It may seem a little counterproductive to head indoors when the beauty of Roatan is ready to greet you without walls, however the butterfly farm, which is located near the west end entrance, is really worth visiting. In addition to an abundance of individuals representing almost twenty species of butterflies, parrots, hummingbirds and toucans can also be found here. The tours through the farm are daily and guided and offer guests a quick and full access up close view of some of the local island inhabitants. 4. Horseback Riding: Many people are familiar with the sight of tourists escapading along sandy shores atop majestic horses while the ocean break dances below them; and, Roatan is a place where this mesmerizing image can quickly and easily become a reality. Guests young and old can be treated to horseback trips alongside very experienced professionals for an adventurous way to experience Roatan. Horseback Roatan excursions are plentiful and whether guests want to start at the beach and head for the hills of West Bay or bounce between Paya Bay and Calabash bright, there is a part of Roatan for everyone to experience equestrian style. 5. Scuba Diving: Regardless of how much there is to do on Honduras’ biggest little island, scuba diving remains one of the most popular excursions booked from the Roatan cruise port. Many head to the Sueno del Mar Dive Center, a more popular organization, to take advantage of the pristine local waters and opportunities to view the exotic corals, sponges, fish and even sharks that dwell below. 6. Snorkeling: Scuba diving is not for everyone however, and for those that do not want to dive deep into adventure, the Roatan cruise port offers many snorkeling excursions that will please any water lover. Kids would love the giant Eagle rays found along the Natural Aquarium Snorkel Trail and schools of sergeant majors can be found in many of the popular snorkeling locales dotted throughout the waters surrounding the island. 7. Kayaking: Getting off one boat and onto another so to speak might not be at the top of everyone’s agenda during cruises to Honduras, however Kayaking does provide a neat and physically active way to enjoy the peaceful waters housing the area’s coral reefs. Kayaks can be shored in various places, giving way to exciting snorkel adventures and chances to stumble upon secluded and enchanting beaches. 8. Institute for Marine Sciences: It is not a joke – this educational sounding outpost is an absolute must catch for any passenger aboard a cruise to Roatan. Why is that? Because it is home to a pretty impressive pack of bottlenose dolphins. The marine mammals are house here at the institute and they put on shows regularly. 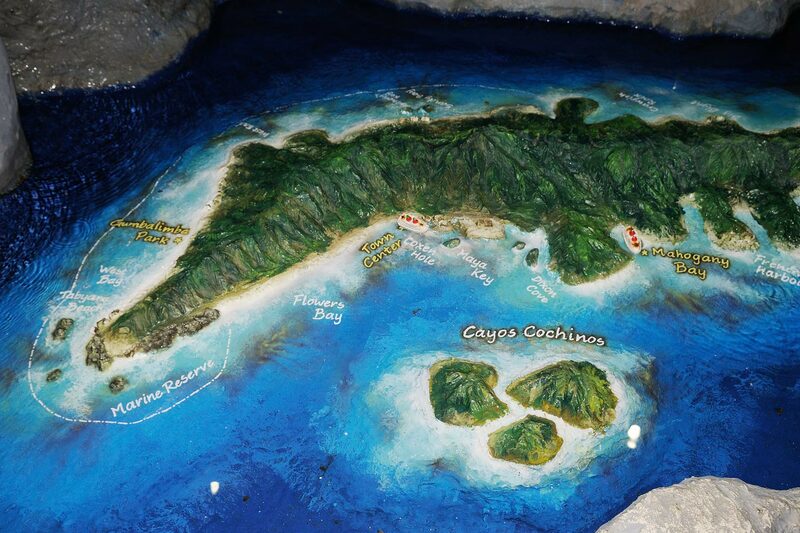 However, this Roatan cruise port favorite does provide some educational value because there is a museum chock full of Bay Island exhibits attached. 9. Zip Line Canopy Tour: From Creation Rock across over a dozen treetop stations, guests can be whisked away on a zip line to really experience Roatan from high above. The adrenaline fueled activity is great for families, but not ideal for young children as even the most adventurous little ones must be at least ten years old to partake in the Tabyana Beach and Canopy Tour. 10. Iguana Farm: Iguanas are a common sight for guests on Western Caribbean cruises as the green ground huggers are found in almost every destination area cruise ships port in. However, the Iguana farm found at the Roatan cruise port is unique in that guests are afforded an opportunity to see hundreds of the critters all at one time during feedings. Interestingly enough, although over two thousand iguanas are housed at the farm, the native lizards on Roatan were nearly decimated for their meat for food. The farm serves as a preserve where the iguanas can roam free safely, and provide immense enjoyment for guests.